This is the second chapter of The Architects Guide to Choosing the Right Carpet. Every interior tells a story. A story of who inhabits the space and what its purpose is. Carpet, with its large range of standard designs and colours and limitless custom design potential, is a vital tool in your armoury for stories that are lively and vibrant, hushed and peaceful, whimsical or conservative. Carpet not only has a major impact on the look of an interior, but also on the sound and feel through its acoustic properties and the warmth and comfort expressed by having something soft underfoot. That tactile sensation is a critical part of the story you tell through interior design. There is just something about a soft, comfortable floor that gives a room a special ambience that can’t be recreated with hard or smooth flooring options such as hardwood, polished concrete or vinyl. Every interior tells a story. A story of who inhabits the space and what its purpose is. If you wish to tell a truly unique story in an interior then custom design carpet is now a faster and more cost effective option than in the past. A quality custom carpet supplier will partner you with one of their designers to help you move from initial inspiration and ideas to the actual carpet design and the production of an installation plan to ensure the results are perfect. 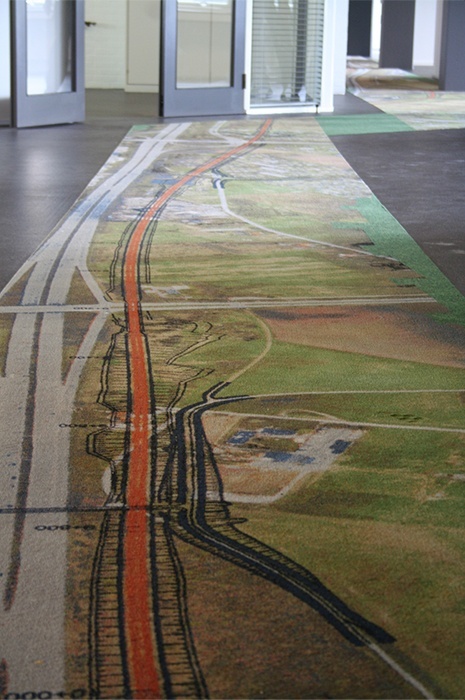 With custom design carpet it’s possible now to go far beyond incorporating corporate colours or company logos. 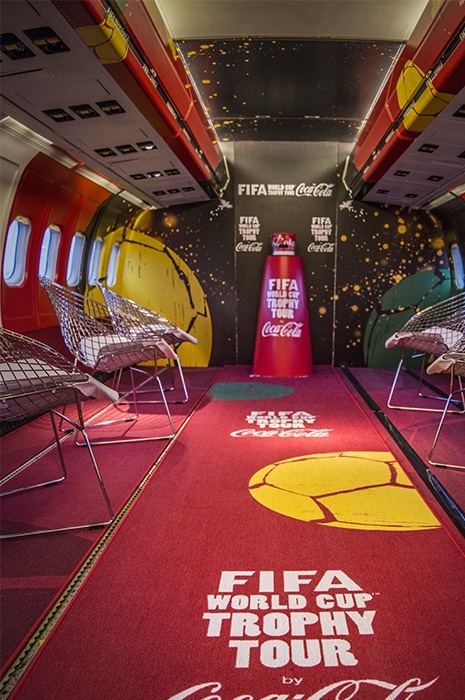 Think laterally and use a custom carpet to allude to the brand’s products or values in the carpet design. Some possibilities might include designing a carpet with bold brushstrokes for a paint manufacturer, or a design of fizzing bubbles for a soft drink manufacturer. If the company’s values include a strong emphasis on social responsibility, employee wellness and environmental responsibility, these values can be reflected in a carpet design using organic colours and patterns that mimic nature. In many interiors, especially large open plan offices, carpet can be used adroitly to indicate the functions of different spaces. Activity based working arrangements now free employees to work where they want, when they want rather than being chained to a single desk all day. Carpet is not only the best flooring option in such environments for its acoustic qualities and ability to absorb noise but can also be used to delineate areas with different functions. 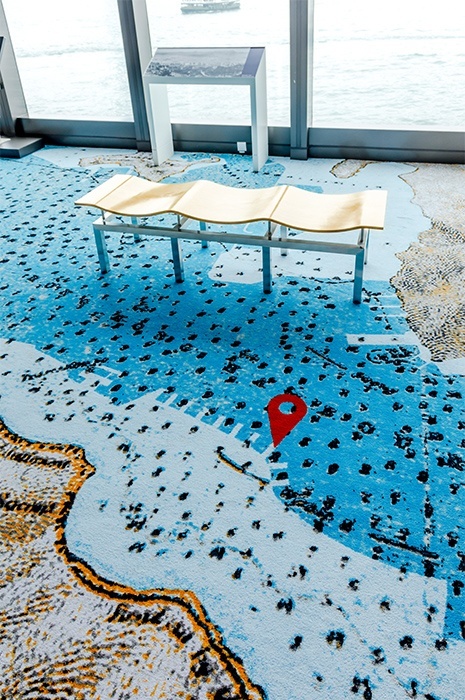 A patterned carpet, for example, can be used in collaborative areas, and a solid colour carpet in muted tones for quiet areas intended for focussed work. Different carpets again can be installed in reception areas, break-out areas and in-house cafes, bars or gyms. After many years of minimalist interiors, more decorative (even maximalist) interiors are a rising trend with an emphasis on jewel colours, luxurious textiles and multiple patterns. Luxurious and plush, wall to wall carpet is an important element in creating lavish interiors for high-end hotels and restaurants, opulent bars and even some workplaces. Use a custom carpet in an exotic and ornate design, reference historical design elements or choose a luxury carpet with a silky soft finish and sheen like panne velvet. Whether you choose the luxury and high end design possibilities of some wall to wall carpet types or the practicality and economy of simple carpet tiles, there’s a carpet available to tell your story. And if you can’t find it, a quality custom carpet supplier can always help you create it. In our next blogpost, we delve into the different carpet types and what to consider when specifying them.